If you can compare an artist’s debut album with any other debut album out there, Lupe Fiasco would be somewhere near what Phonte, Big Pooh and 9th Wonder did as Little Brother with Listening, or what El-P did with Fantastic Damage. These records weren’t necessarily five-mic classics, but they were a nice change from the ordinary, further pushing the hip-hop sphere of sound. With Food & Liquor, Lupe comes from Chicago’s west side to throw a variety of songs that tackle serious topics hidden underneath slippery wordplay. The title of Lupe’s debut is a definitive way to look at life’s constant battles, with good (food) always battling evil (liquor). On “American Terrorist,” he discusses America’s history of terrorist activity (“Don’t give the black man food/ Give red man liquor“), while “Hurt Me Soul” tackles Lupe’s own struggle with hip-hop and its patriarchal stronghold. With these strong themes and topics, Lupe makes it a mission to articulate them through his own artistic vision, relaying a tangling maze of rhythm, rhymes and a clear cadence. “Kick, Push” rocks the stereo with quick-cutting rhymes about growing up, and “Sunshine” chronicles a first date under a sheath of extended metaphors and interchanging rhyming bars (“Never met her before/ But I think I like her like a metaphor/ It’s hard to get”). Creativity dominates Food & Liquor, but there’s also a clear and straightforward message of positivity here, and with what seems to be of little effort, Lupe Fiasco delivers on his debut. Most people first encountered Lupe Fiasco’s high-pitched flow when he declared, “guess who’s on third?/ Lupe steal like Lupin the third” on Kanye West’s classic “Touch The Sky.” A year later, the Chicago MC would drop his debut record, Lupe Fiasco’s Food & Liquor, and take the hip-hop world by storm. Food & Liquor is the perfect blend of personal reflection and larger social commentary, that reveals another side to hip-hop in Chicago that can be compared to the legends such as Common or Kanye in a new-age type of way. From there Lupe recites the opening lines to the Qu’ran and begins to tell his story in album form. The second aspect to this album that is great goes with the first. Through his lyrics, Lupe presents himself as a multifaceted MC that can speak to many different, and equally important topics. His Muslim faith is a huge part of his identity and you hear that. “Kick, Push,” is a commentary on boyhood, individuality, skate culture and love. “American Terrorist” problematizes the history of imperialism in the United States. On the ninth track, “Daydreamin,’” Lupe satirizes gangsta-rap culture while also shining a light on conditions in the hood. If you watch or read interviews by Lupe Fiasco, he is someone that has much to say and is known to be outspoken on a lot of different issues. As his debut album, Food & Liquor serves as an introduction into some of these thoughts and opinions as he seamlessly transitions over the course of sixteen tracks. As an MC, Lupe reminds us of the power of words. Featured guests such as Jay-Z, Jill Scott, Gemini and Matthew Santos drop in, adding lyrical and vocal accents to the already intact work. With production from Kanye West, Prolyfic, Soundtrakk and The Neptunes, the beats add the final layer to all that has been said, sung and recited. Lupe Fiasco is referred to as an influential figure in hip-hop because of what he has done and continues to do within the culture. He has a way of mixing satire and criticism that is hard to come by. 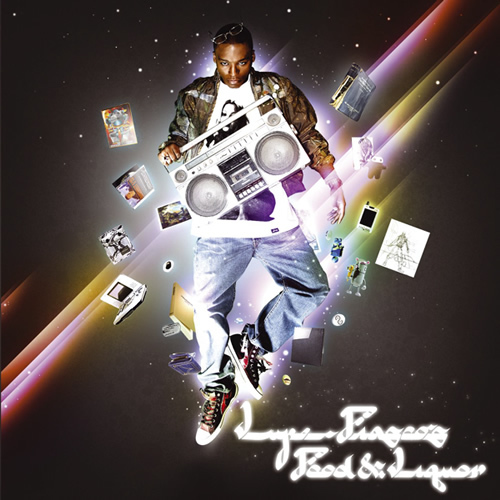 On his debut album, Lupe Fiasco’s The Food & Liquor, you can hear where some of that comes from.